It’s been a while since we’ve posted about geocaching, but never fear, it’s on our (read: Brigette’s) minds a lot, especially since fellow geocachers have recently been busy hiding lots of caches in the woods just down the road from the Inn on Mill Creek. 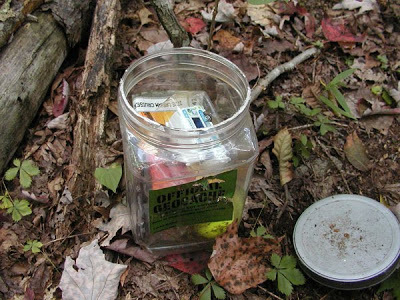 Over the past few months, we haven’t had the opportunity to go geocaching, so those caches have been sitting there taunting us all summer long. If you’re a geocaching enthusiast, you will understand what we mean by geocaches taunting us when you see this Google map. 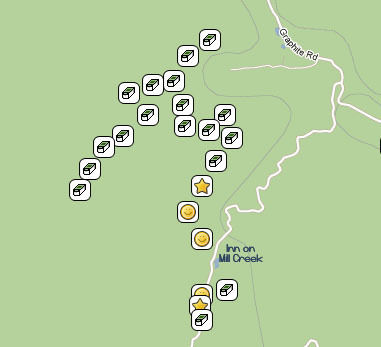 This is within a little over a mile of the Inn (smiley faces are the ones we’d found before September; stars are caches that we’ve hidden). Yes, those are 18 geocaches recently planted that we’ve had to wait until now to get. Then September arrived, and we were able to do some hiking and geocaching with our frequent guests-turned-friends (griends? frests?) and fellow geocachers, Travis and Nicole. On our way back, we swung by one of the caches (pictured at the top of this post) that we’ve hidden on our property in the woods to check on it. Maintenance is an important part of geocaching. Other than being a few feet away from where it’s supposed to be and looking like a furry critter had been playing with it, it was in pretty good shape and there were lots of goodies inside that cachers had traded in and out. After a brief hiatus, we’re ready to get back into the geocaching swing of things! Interested in learning more about geocaching? Here’s an animated video from www.geocaching.com that explains just what geocaching entails. Thinking about geocaching when you stay at the Inn? You’re in luck. 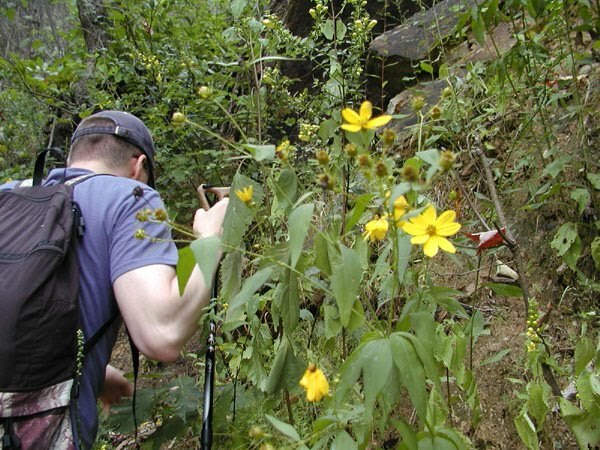 The Asheville/Black Mountain area is well represented in the world of geocaching. There are over 100 caches hidden within five miles of the Inn. This entry was posted in Uncategorized and tagged geocaching, guests by Inn on Mill Creek. Bookmark the permalink.